Cozy mysteries are a guilty pleasure of mine! This entry was posted in Other and tagged book. I just love the grey cat in the picture! I never heard the term ‘Cozy mysteries’ before, but I think I would like them as well, so thanks for this tip. He is a part Chartreux. I got him as a rescue cat. He definitely rules the house at this point. Allergic to Death looks great! 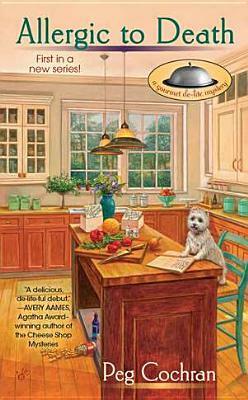 I haven’t read a lot of cozy mysteries, but this one sounds fun. Finished it last night and it was ok, I have found that usually the first book in a cozy series is not the best, so i will probably read another before I judge it. I really hope you enjoy your book this week, looks enjoyable. I’m just the opposite, I read Stephen King and classics in High School I just started reading cozies about 6 years ago. We have two cats, both rescues, but the grey one is my baby. This sounds fun 🙂 I love cozy mysteries, although I haven’t read one in such a long time. Happy reading & have a great week! I always enjoy a good mystery. And the cat on the cover is cute. I’m currently reading The Host by Stephenie Meyer. I haven’t read The Host, isn’t that a dystopian novel? I am often in the mood for cozies too. Right now I am reading the first in new series, a book collector’s mystery, The Christie Curse by Victoria Abbott. It’s quite good. I’ll have to look up that one. Love the cover and know a good friend of mine who would love that book! I really like the look of your blog – the cat is too funny! It was pretty good for the first in a series. I’m a cozy mystery addict! Hoping to read Killer in Crinolines and Gluten for Punishment soon. I just bought Iced Chiffon tonight and am going to read it before I move on to Killer in Crinolines. I usually alternate cozies with other genres although I have been known to go on cozy binges. Hope ou enjoy your reading this week and the next book in the series is better! Here’s my Monday post if you’d like to stop by. I usually find that series get better after the first one. Usually so much time is spent in the first book establishing characters, relationships, and setting that they are a little slower than later books. My favorite genre is the cozy mystery. I am new to the Monday Reading meme. Here is my wrap-up. I started my book blog last month, and use pictures of my grey cat also – at Jane Reads. I am new to the the Monday Reading meme as well. I am looking at lots of great book blogs and seeing fun things happening.